The central position of our farmhouse in Tuscany, with roads winding through gentle hills covered in vineyards and olive groves, means that art lovers and culture vultures can easily reach Tuscany’s great art centres with Florence, Siena, Lucca and Pisa only 50 km away. San Gimignano is a 15-minute drive away and Volterra can be reached in half an hour. Farmhouse in Tuscany "Montaione Borgo" is the perfect place for a holiday in Tuscany all year round because each season has a wealth of things to offer. A spring holiday with its bright colours, lovely flowers and fragrances allows you to experience nature waking up again, a summer holiday with the hot sun embracing your limbs fills you with energy, an autumn holiday will make you marvel at the rich colours, the delicious smell of must turning into Chianti and the winter will allow you to experience the pleasure of living in a cosy apartment with wooden beams and terracotta tiling. The welcoming functional apartments are furnished in classic Tuscan style and have well-equipped kitchens that will allow you to prepare even the most elaborate dishes of the Tuscan cuisine if you wish. There is a beautiful big swimming pool (25x5 m.) where you can do lengths or have a refreshing dip. If you have children they’ll enjoy playing in the smaller pool (10 x 5m) which has a separate section for toddlers so you can enjoy your holiday in peace. If you prefer keeping cool to sunbathing you're in the right place because our accommodation in Tuscany is surrounded by big shady trees. Guests can use the barbecues or enjoy al fresco meals while admiring the wonderful sunsets over the Tuscan hills or the spectacular view of the Chianti hills. If you want an active holiday you can go trekking on the many trails in the surrounding countryside or take place in group treks organised once or twice a week. 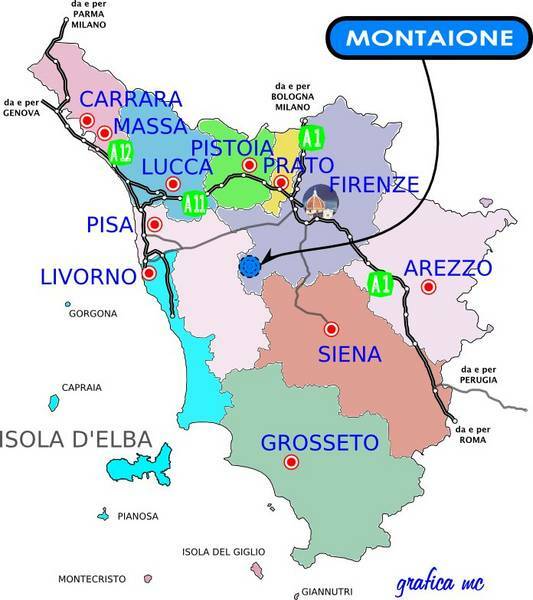 Golf lovers can also practice their favourite sport because" Montaione Borgo" has an arrangement with the local Castelfalfi golf club (8 km away from the accommodation) with discounts and reductions for the farm’s guests. There is a riding school only a kilometre away and there are also horse trekking sessions (half or whole day with al fresco lunch) allowing you to enjoy the pleasures that the Tuscan countryside has to offer. Those wishing to play tennis have only to go to Montaione where there is a lovely tennis court that is covered during the autumn/winter season making it suitable for use all year round. Guests are welcome to use the ping-pong table in the farm garden. The old cellar has been converted into a lovely room where guests can taste typical Tuscan wines and local products. The Colli Senesi apartment is situated in the most elegant part of the farmhouse and can be reached via the main entrance. The old stone staircase leads to the first floor where the Bolgheri apartment is also located. This apartment has an exceedingly spacious living room furnished in Tuscan stile, a kitchenette, two armchairs that can be converted into comfortable beds if required, a double bedroom, a twin bedroom with two single beds and a bathroom with shower. The kitchen is well supplied with cooking utensils, glassware and crockery as well as with a fridge, an electric oven, four-ringed gas hob, moka coffee pot and gas detector. The apartment also has a colour television with satellite channels and a telephone (direct outgoing calls can be made abroad if wished). The apartment is situated in the most elegant part of the farmhouse and can be reached via the main entrance. An old stone staircase leads to the first floor where the Quercia and Melograno apartments are situated. The Quercia apartment has a large living room furnished in pure Tuscan style, with a kitchenette and two comfortable armchairs that can be swiftly transformed into beds, a double bedroom with a small bed, a twin bedroom with two single beds and a bathroom with shower. The kitchen is well supplied with cooking utensils, glassware and crockery and has a fridge, an electric oven, four-ringed gas hob, moka coffee pot and gas detector. All windows are fitted with mosquito nets. The garden below contains several groups of tables and chairs and a barbecue where you can have al fresco lunches or evening meals as well as using the barbecue. There are many deckchairs in the garden where you can relax and enjoy the surrounding Tuscan countryside. A comfortable apartment for your family holidays in Tuscany. The Brunello di Montalcino apartment is the farm's largest apartment. It is a ground-floor apartment situated in the central part of the building and has a private patio area with a table and chairs for al fresco meals. There is also a beach umbrella and deckchairs where you can spend many relaxing moments. The apartment has a lovely spacious living room furnished in Tuscan style with a sofabed that opens up into a comfortable double bed if needed. The kitchen is equipped with a fridge, an electric oven, and four-ringed gas hob, as well as cooking utensils, crockery and glassware. There is also a moka coffee pot and a gas detector. There is a double bedroom with a small bed, another double bedroom, a twin bedroom with two single beds and a bathroom with shower. All the windows are fitted with mosquito nets. This ground-floor apartment has a private patio area with a table and chairs where you can lunch or dine al fresco. There is also a beach umbrella and deckchair, ideal for spending relaxing moments during your holidays. The Carmignano Rosso apartment, situated entirely on the ground floor, has an extremely charming living room distinguished by various architectural features. The living room has a separate kitchenette. There is a double bedroom to which a third bed can be added, a twin bedroom with two single beds and a bathroom with shower. This apartment is situated in the western wing of the farmhouse. The Chianti classico apartment is on the first floor next to the Chianti Rufina apartment. The living room is furnished in Tuscan style with a kitchenette and a comfortable armchair which can be converted into a bed if necessary. A small hall leads from the living room to the main bedroom which has two windows with a lovely view of the farm and the surrounding Tuscan countryside; there is an en-suite bathroom with shower. Another small hall leads to an antique stone staircase going up to a twin bedroom with two single beds and a snug bathroom. The apartment also has a colour television with satellite channels and a telephone (direct outgoing calls can be made abroad if wished). All windows of the apartment are fitted with mosquito nets. The garden below contains several groups of tables and chairs and a barbecue where guests can have al fresco lunches or evening meals as well as using the barbecue. Dotted all around the garden you'll find lots of deckchairs where you enjoy relaxing moments during your holidays. A country-style apartment for your holiday in Tuscany. The Chianti Rufina apartment is on the first floor of the west wing, next to the Chianti classico apartment. As you enter you will find yourself in a spacious living room with lovely, typically Tuscan, antique stone walls. The living room is furnished in Tuscan style; there is a kitchenette and a comfortable sofa which can be converted into a double bed if necessary. The kitchen is supplied with a complete set of cooking utensils, glassware and crockery as well as with an electric oven, fridge, four-ringed gas hob, moka coffee pot and gas detector. A solid wood staircase leads to the upper floor where there is a double bedroom (a single bed can be added if necessary), a twin bedroom with two single beds and a bathroom with shower. The windows all have mosquito nets. The garden below contains several groups of tables and chairs and a barbecue where guests can have al fresco lunches or evening meals as well as using the barbecue. The deckchairs dotted all around the garden are perfect for relaxing moments enjoying the sensations that the Tuscan countryside offers its visitors. An apartment with a lovely view for your holiday in Tuscany. The Alloro apartment is in the more “noble” part of the farmhouse and can be reached via the old stone staircase leading to the first floor from the main entrance; the Colli Senesi end Bolgheri apartments are on the first floor and the Colli Fiorentini and Cortona San Giovese apartments are on the second floor. The apartment has a spacious living-room furnished in Tuscan style, a handy kitchenette and two armchairs that can be folded out into beds if needed. There is a very large double bedroom (two small beds can be added if necessary), a bedroom with two single beds and a bathroom with shower. The kitchen is well supplied with cooking utensils, glassware and crockery as well as with an electric oven, fridge, four-ringed gas hob, moka coffee pot and gas detector. The windows are all fitted with mosquito nets. The garden contains several groups of tables and chairs and a barbecue which can be used for pleasant al fresco lunches or evening meals. There are also lots of deckchairs where you can relax enjoying the calm of the Tuscan countryside surrounding the farm. The Cortona San Giovese apartment is situated in the "noble" part of the farmhouse. After entering the house via the main entrance we go up the old stone stairs taking us to the second floor where the Cortona San Giovese and Colli Fiorentini apartments are located. This apartment has an exceedingly spacious living room furnished in Tuscan stile with a kitchenette and two armchairs that can be converted into beds if required, a double bedroom, a twin bedroom with two single beds and a bathroom with shower. The kitchen is supplied with cooking utensils, glassware and crockery as well as with a fridge, an electric oven, four-ringed gas hob, moka coffee pot and gas detector. The apartment also has a colour television with satellite channels and a telephone (direct outgoing calls can be made abroad if wished). All the windows are fitted with mosquito nets. The garden below contains several groups of tables and chairs and a barbecue which can be used for al fresco lunches or evening meals. The various deck chairs dotted around in the garden invite the farmhouse guests relax and enjoy the pleasure of being in touch with nature that only a holiday in Tuscany can offer. The Montecucco apartment on the ground floor has a patio with a table and chairs for al fresco meals and a beach umbrella and deckchair where you can relax. The Montecucco has a lovely spacious living room furnished in Tuscan style with a sofabed that opens up into a comfortable double bed if needed. A solid wood staircase leads to the upper floor where there is a romantic bedroom with an antique stone wall and a window with a spectacular view of those marvellous sunsets typical of the Tuscan hills. Adjacent to the bedroom is a bathroom with shower. This ground-floor apartment has a very reserved patio area equipped with a table and chairs that is perfect for al fresco lunches or evening meals. The terrace also has a beach umbrella and deckchair where you can enjoy relaxing moments during your holidays. The Morellino di Scansano apartment is situated entirely on the ground floor and has a living room furnished in classic Tuscan style with an extremely handy kitchenette, a double bedroom, a twin bedroom with two single beds and a bathroom with shower. A cosy apartment decorated in warm colours, perfect for an unforgettable holiday. This ground-floor apartment has a private patio area equipped with a beach umbrella and deckchair where you can spend many relaxing moments. There is also a table and chairs for delightful al fresco meals. The Nobile di Monte Pulciano apartment is situated entirely on the ground floor and has a living room furnished in Tuscan style with a well-equipped kitchenette, a welcoming double bedroom, a twin bedroom with two single beds and a bathroom with shower. All windows are fitted with insect screens. The Vernaccia di San Gimignano apartment, situated on the ground floor, has a private patio area equipped with a table and chairs where you can enjoy peaceful al fresco lunches or evening meals. There is also a beach umbrella and deckchair where you can enjoy relaxing moments during your Tuscan holidays. The apartment has a lovely living room furnished in Tuscan style with a separate kitchenette and a comfortable armchair which can be converted into a handy single bed if necessary. The kitchen is supplied with cooking utensils, glassware and crockery and with a fridge and four-ringed gas hob, as well as an electric oven, moka coffee pot and gas detector. A small hallway leads to the bathroom with shower. A solid wood staircase leads to the upper floor where there is a double bedroom with a single bed and a twin room with two single beds.